On the same day I visited the High Museum of Art, as I was leaving the Sifly Piazza I glanced up at one of the adjoining buildings and a high interior wall decorated with various size disco balls drew my eye and piqued my interest. 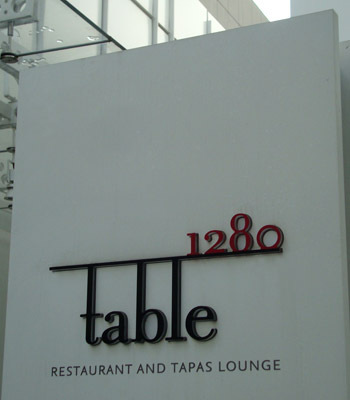 I walked over to investigate and discovered that it was the lounge of Table 1280, an artfully appointed restaurant and tapas lounge. I couldn't resist the urge to go in, even though I wasn't hungry. I was brightly greeted by Elizabeth, the hostess, who welcomed me cheerfully—a surprise given it was the end of the restaurant's lunch hours. I explained, non-committing, that I only wanted to see the dining room and look over the menu. Elizabeth graciously invited me in. After a peek in the dining room and a glance at the menu, I gave in to the temptation to have lunch—a tourist has to eat, right? Elizabeth escorted me to my table, which had a clear view of the piazza and the dining room in their entirety—the best seat in the house! 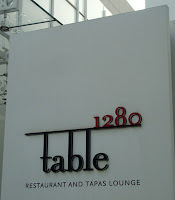 Within moments, Vangel, who seemed to me to be Italian based on his accent and demeanor (I have friends from Rome back in DC), welcomed me to Table 1280. I ordered a glass of sauvignon blanc (the generous pour arrived quickly) and perused the manageable but descriptive menu. Decisions, decisions. I was soon enjoying a hot and perfectly seasoned fettuccini with a wild mushroom ragout drizzled with a balsamic reduction and topped with a generous portion of shaved parmesan cheese. I ate far more than enough to satisfy my appetite—again, I couldn't help myself. As I began to wonder if it was really that good or whether I actually was hungry when I came in and just hadn't realized it, I noticed a mother and daughter duo who had just finished their meal and were preparing to leave. The daughter wheeled her mother (they just had to be close relatives given the remarkable similarity of facial features), a seemingly delightful woman with a fluffy but well-kempt head full of silver hair, to where a tables where one of the restaurant's chefs had joined his family who were having lunch as well. He was wearing his chef's apron and Vangel later told me that he indeed was one of the restaurant's chefs. 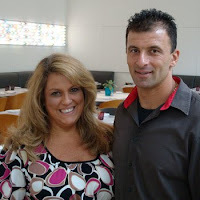 The mother offered a kind greeting and then told the chef, "That was the best pasta I've had in my entire life." That was enough to confirm without a doubt that my pasta was just as delicious as I thought it was. When I could eat no more, I settled in with my sauvignon blanc as I watched the mother and daughter venture across the piazza and into the High Museum of Art where I had come from not too long before. Vangel returned promptly and offered the dessert menu, which I agreed to view, just out of curiosity, of course. As he handed me the menu, Vangel told me about one of the restaurant's signature desserts—a poached peach on a scone-like biscuit with vanilla ice cream, candied ginger and a not-too-sweet whipped cream. Without even looking at the dessert menu, I gave it back and ordered the peach…every bite was delicious! When I asked for the check, Vangel inquired if I was a member of the High Museum. Presumably he'd noticed the museum literature I'd been reading between courses. My membership entitled me to a 20% discount on my meal, as well as parking validation. 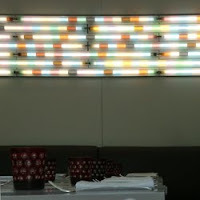 A friend's 80-something year old mother once proclaimed, "Dining should be an experience." I whole-heartedly agree with her. So, the question is: Will I go back? Definitely, without question. I'm actually rather curious about the tapas lounge and from their Sunday brunch menu I can already hear the bananas foster pancakes calling my name! Tuesday-Wednesday: Lunch, 11 a.m. - 3 p.m.; Dinner, 5 p.m. - 8:30 p.m.; Lounge, 3 p.m. - 9 p.m.
Thursday-Saturday: Lunch, 11 a.m. - 3 p.m.; Dinner, 5 p.m. - 9 p.m.; Lounge 3 p.m. - 10 p.m.
Sunday: Brunch, 11 a.m. - 3 p.m.; Lounge, 12:30 p.m. - 6 p.m.